In March 2005 NCI Headquarters was told that there was a possibility that the old coastguard station at Worm's Head might become available to lease. Someone in NCI Headquarters knew the Gower Peninsular and was able to advise the Trustees that the Look Out was set in a very beautiful but also very dangerous coastline. Between April 2005 and February 2006 NCI Headquarters held discussions with the National Trust to establish their view on the future use of the building. The National Trust made it clear that they would be happy to see NCI use the building in something approaching its original role. During the same period NCI held discussions with some local groups and local residents to try to get a feeling for the need for them to operate in the area and the likelihood of support. Both NCI and the National Trust were convinced of the need for NCI at Worm's Head. Gower attracts a large number of visitors of whom more than 300,000 visited the Worm's Head area last year. The dangers, along with the beauty of the area, are very real and there have been a number of fatalities in the area in recent times together with a larger number of less serious incidents. A 15 year lease on the building was finally signed in May 2006. In June 2006 NCI visited Swansea and started a publicity campaign and on 1 August a public meeting was held in Middleton Village Hall. Some twenty people attended. A follow up meeting was held on 5 September and after these two meetings 19 volunteers joined NCI Worm's Head. On 9 September a first meeting of the volunteers was held and by 14th November a training programme had been devised and was underway. NCI Worm's Head 'with its 19 volunteers' set itself the target of opening as an operational station in time for the Easter Week end 2007. That meant just thirty weeks to get everything up and running from scratch and a large number of those weeks were in the winter! The training of volunteers was not a problem, the equipment and materials needed were readily available and a quite remarkable man, from the team that operates the Loughor Inshore Lifeboat, gave his time freely each week to take groups of volunteers through the training syllabus. But, in other respects, we had our problems. We had a 'Look Out' which showed all the signs of having been unoccupied for some considerable time. It had no running water, no electricity, no telephone, no heating and as if all that is not enough no toilet! All of this a one mile walk from the Rhosilli car park! The saving grace is that the views are fantastic! What we needed was a weather proof 'Look Ou't equipped with binoculars, telescopes, hand bearing compasses, VHF Radio, short range Walkie Talkie Sets, a chart table and charts, maps of the local area, power for the radios, an accurate and automatically updating clock, a weather station, loud hailing equipment, smoke canisters, high visibility jackets, some sort of domestic arrangements to allow us to make tea and to wash up afterwards, furniture, secure storage facilities for the equipment, some form of heating and, of course, a toilet! The one slight snag in all of this was we had no money!! NCI Headquarters helped us with an interest free, start up, loan. The volunteers themselves set to to raise money through collecting boxes in local shops and the organisation of events such as coffee mornings, bridge meetings and, as the weather improved garden parties. They also let local businesses, clubs and organisations know what we were aiming to do and why, and all of these organisations helped out with generous donations. It took more than 1,000 man hours of volunteer time to refurbish and secure the building. We installed a bank of batteries and the trunking and wiring to feed the equipment along with the means to collect and recycle water from the roof. Volunteers spent hours at boat jumble sales and in chandlers not only trying to get the best possible deals on the equipment which we needed but also trying to avoid falling into the trap which defines a bargain as 'Something which you donate/need, at a price you can't resist'! 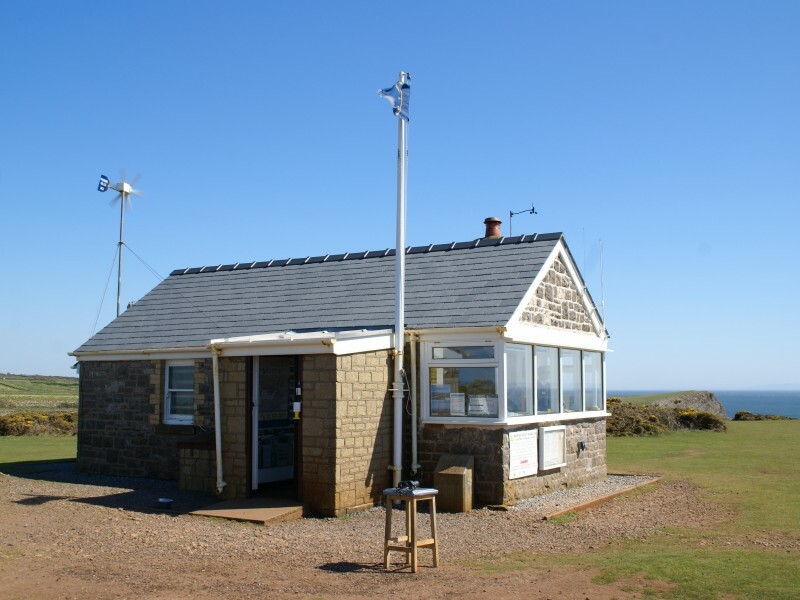 The upshot was that one week before Easter 2007 NCI Worm's Head Look out opened as an operational station. One week ahead of target. The cost of materials for the refurbishment and enough equipment to operate satisfactorily was relatively modest. However, this totally ignores the materials and equipment which somehow or other found their way into our look out totally free of charge. I hasten to add that we are absolutely certain that none of the paint, or other materials 'Fell off the back of a lorry'!! However, if ever there was proof needed that the innate generosity of people who recognise a worthwhile cause is very much alive and in evidence, this was it. We owe a large debt of gratitude to a multitude of local people.